Accounting is focused on recording and reporting how a business performed in the past, while financeFinance DefinitionFinance is defined as the management of money and includes activities like investing, borrowing, lending, budgeting, saving, and forecasting. There are three main types of finance: (1) personal, (2) corporate, and (3) public/government. is focused on analyzing and forecasting how a companyCorporationWhat is a corporation? A corporation is a legal entity created by individuals, stockholders, or shareholders, with the purpose of operating for profit. The creation involves a legal process called incorporation where legal documents containing the primary purpose of the business, name, and location is expected to perform in the future. This guide will compare accounting vs finance across various aspects. Learn more about finance career in CFI’s Financial Analyst Certification ProgramFMVA™ CertificationThe Financial Modeling & Valueation Analyst (FMVA)™ accreditation is a global standard for financial analysts that covers finance, accounting, financial modeling, valuation, budgeting, forecasting, presentations, and strategy. .
AccountingAccountingOur Accounting guides and resources are designed as self-study guides to learn accounting and finance at your own pace. Browse hundreds of articles on important topics such as the income statement, balance sheet, cash flow statement, depreciation methods, how to link the 3 statements, debits & credits, journal entries is concerned with collecting all financial data for an entity, entering it into a ledger, and generating reports the summarize what happened in the past. Accountants are responsible for collecting all financial data and may do so by obtaining receipts, invoicesSource DocumentsEvery time a business is involved in a financial transaction, a paper trail is generated. This paper trail is referred to in accounting as source documents. Whether checks are written to be paid out, sales are made to generate receipts, billing invoices are sent by suppliers, work hours are recorded on an employee’s time sheet – all the respective documents are source documents., and reports that pertain to all a business’ revenues and expensesAccrued ExpensesAccrued expenses are expenses that are recognized even though cash has not been paid. These expenses are usually paired up against revenue via the the matching principle from GAAP (generally accepted accounting principles). For those who are unaware of the matching principle. For example, all customer orders, prices paid for each product, inventory records, payroll reports, and capital purchasesCapital ExpenditureA Capital Expenditure (Capex for short) is the payment with either cash or credit to purchase goods or services that are capitalized on the balance sheet. Put another way, it is an expenditure that is capitalized (i.e. not expensed directly on the income statement) and is considered an "investment". Analysts view Capex. The central system accountants use to manage the data they collect is called the general ledgerGeneral LedgerGeneral Ledger (GL) is a set of all past transactions of a company organized by accounts. The general ledger (GL) accounts contain all debit and credit transactions affecting them.. The ledger keeps a record of all transactions that take place, no matter how big or small. To learn more, see our guide to debits and credits. The general ledger is then used to generate financial statementsThree Financial StatementsThe three financial statements are the income statement, the balance sheet, and the statement of cash flows. These three core statements are intricately linked to each other and this guide will explain how they all fit together. By following the steps below you'll be able to connect the three statements on your own.. The main form of the report that accountants prepare is the set of consolidated financial statements, which includes the income statementIncome StatementThe Income Statement (or Statement of Profit and Loss) shows performance from operations of a business. The financial statement begins with revenues and, balance sheetBalance SheetThe balance sheet is one of the three fundamental financial statements. These statements are key to both financial modeling and accounting. The balance sheet displays the company’s total assets, and how these assets are financed, through either debt or equity. Assets = Liabilities + Equity, and statement of cash flowsStatement of Cash FlowsThe Statement of Cash Flows is one of the 3 key financial statements that reports the cash generated and spent during a specific time period, it acts as a bridge between the income statement and balance sheet. In addition, there are lots of ad-hoc analysis and management reports that are generated. 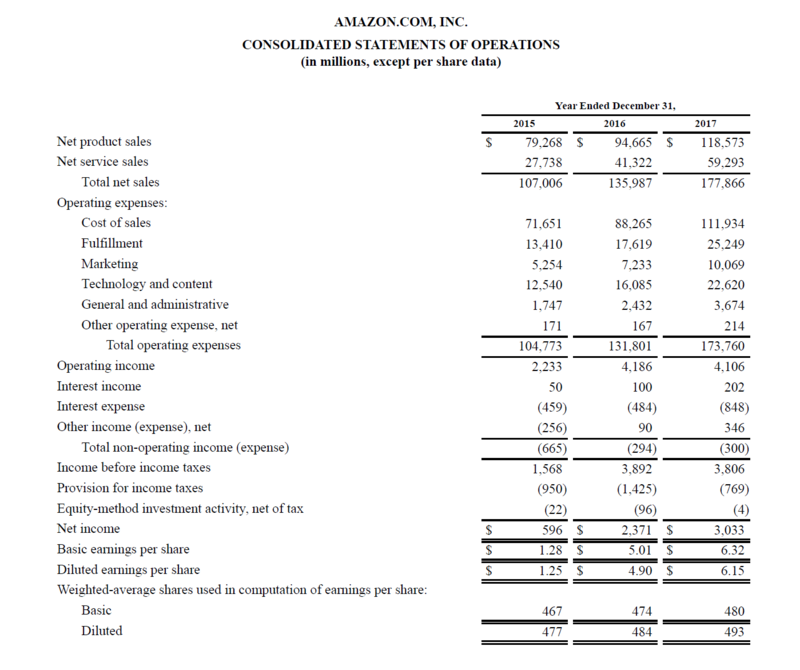 Below is an example of an accounting report: the income statement. Finance is concerned with analyzing an entity’s financial position, evaluating its past performance, and predicting how it will perform in the future. Analysts spend a great deal of time analyzing a company’s financial position, which includes its capital structureCapital StructureCapital Structure refers to the amount of debt and/or equity employed by a firm to fund its operations and finance its assets. The structure is typically expressed as a debt-to-equity or debt-to-capital ratio. Debt and equity capital are used to fund a business’ operations, capital expenditures, acquisitions,, cost of capitalCost of CapitalCost of capital is the minimum rate of return that a business must earn before generating value. Before a business can turn a profit, it must at least generate sufficient income to cover the cost of the capital it uses to fund its operations. Cost of capital consists of both the cost of debt and the cost of equity, working capitalNet Working CapitalNet Working Capital (NWC) is the difference between a company's current assets (net of cash) and current liabilities (net of debt) on its balance sheet. It is a measure of a company’s liquidity and its ability to meet short-term obligations as well as fund operations of the business. The ideal position is to, liquidity, and funding requirements. While accountants are the ones who prepare financial statements, financial analysts are the ones who spend a great deal of time analyzing them and looking for insights into how the company is performing. It includes the evaluation of profitabilityProfitability RatiosProfitability ratios are financial metrics used by analysts and investors to measure and evaluate the ability of a company to generate income (profit) relative to revenue, balance sheet assets, operating costs, and shareholders' equity during a specific period of time. They show how well a company utilizes its assets, rates of returnRate of ReturnThe Rate of Return (ROR) is the gain or loss of an investment over a period of time copmared to the initial cost of the investment expressed as a percentage. This guide teaches the most common formulas for calculating different types of rates of returns including total return, annualized return, ROI, ROA, ROE, IRR, margins, growth, and many other types of financial statement analysisAnalysis of Financial StatementsHow to perform Analysis of Financial Statements. This guide will teach you to perform financial statement analysis of the income statement, balance sheet, and cash flow statement including margins, ratios, growth, liquiditiy, leverage, rates of return and profitability. See examples and step-by-step instruction. This is the biggest differentiator of accounting vs finance. Financial AnalystsFMVA™ CertificationThe Financial Modeling & Valueation Analyst (FMVA)™ accreditation is a global standard for financial analysts that covers finance, accounting, financial modeling, valuation, budgeting, forecasting, presentations, and strategy. 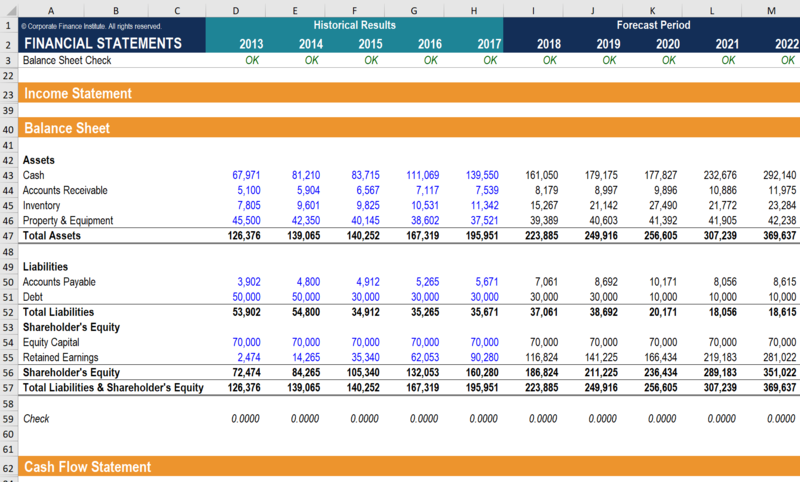 spend a great deal of time predicting how a company will perform in the future by building financial models in Excel. The types of financial modelsTypes of Financial ModelsThe most common types of financial models include: 3 statement model, DCF model, M&A model, LBO model, budget model. Discover the top 10 types of Excel models in this detailed guide, including images and examples of each. Financial modeling is performed for many reasons including to value a business, raise money include a standard 3-statement model3 Statement ModelA 3 statement model links the income statement, balance sheet, and cash flow statement into one dynamically connected financial model. 3 statement models are the foundation for advanced financial models such as DCF models, merger models, LBO models, and others. This three statement model guide has examples, images, discounted cash flow (DCF modelDCF Model Training Free GuideA DCF model is a specific type of financial model used to value a business. DCF stands for Discounted Cash Flow, so the model is simply a forecast of a company’s unlevered free cash flow discounted back to today’s value. This free DCF model training guide will teach you the basics, step by step with examples and images) valuation, scenario analysisScenario AnalysisScenario analysis is a technique used to analyze decisions through speculating various possible outcomes in financial investments. In financial modeling, this process is typically used to estimate changes in the value of a business or cash flow. By using the Choose or Offset functions an analyst can crease base case, and transactions such as mergers and acquisitionsMergers Acquisitions M&A ProcessThis guide takes you through all the steps in the M&A process. Learn how mergers and acquisitions and deals are completed. In this guide, we'll outline the acquisition process from start to finish, the various types of acquirers (strategic vs. financial buys), the importance of synergies, and transaction costs. Below is an example of a financial model prepared by an analyst. The objectives of professionals working in accounting and finance have some overlap and some major differences. Below is a list of what each profession is primarily concerned with. Both accounting and finance offer rewarding and exciting careers. Which one is a better fit will largely come down to your personal objectives and personality type. Below are some of the most common jobs and careers for each profession. Financial AnalystFMVA™ CertificationThe Financial Modeling & Valueation Analyst (FMVA)™ accreditation is a global standard for financial analysts that covers finance, accounting, financial modeling, valuation, budgeting, forecasting, presentations, and strategy. Manager, Corporate DevelopmentCorporate DevelopmentCorporate development is the group at a corporation responsible for strategic decisions to grow and restructure its business, establish strategic partnerships, engage in mergers & acquisitions (M&A), and/or achieve organizational excellence. Corp Dev also pursues opportunities that leverage the value of the company’s business platform. Managing Director, Investment BankingInvestment BankingInvestment banking is the division of a bank that serves governments, corporations & institutions, providing underwriting (capital raising) and mergers and acquisitions (M&A) advisory services. As you can see, there is some overlap between accounting vs finance jobs, as many of these positions are suitable for people from either background. Check out CFI’s Interactive Career Map to learn more! Accounting Firms in the USAccounting Firms in the USAccounting firms in the US saw strong growth in the five year period from 2013 to 2018, helped by rising equity markets, an increasing number of businesses, and overall economic growth. Revenues from US accounting services - including accounting, tax preparation, and payroll services - increased by more that 50%.